This site is a journal that accumulates 30+ years of research to reverse engineer nervous systems from organic, living animals to in silica representations. My latest research has developed out of my participation in the OpenWorm Project. 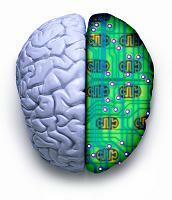 My task within this venture has been to develop morphology data bases starting with NeuroML. I've taken the work we did to define the C. Elegans connectome, adapted it to a MS SQL 2012 database, rewrote my original system made up of programs that simulate individual neurons to mimic the C Elegans nervous system. In addition, I created a sensory stimuli interface, and taken the resultant motor-neuron to muscle output to try and test how the connectome processes signals that gives the C. Elegans nematode it's behavoir. Use this Search Engine for find out more information regarding Artificial Minds and Inorganic Brains!